Last night as I was unpicking something that I had sewn for the umpteenth time, I had a vision of my mother hunched over her sewing machine late at night with Christmas quickly approaching. The Christmas I was remembering was when she made me some totally rad hair scrunchies out of this glittery sheer fabric. She had me come into her sewing room without looking and turn around so that she could try the scrunchies out in my hair and adjust the fit. I had them in a rainbow of colors. I was the envy of all my friends...or at least I thought I was. Before that, she made me nightgowns which were more on the adorable side of awesome. I sat back for a minute to think about my mom while I let my shoulders detach themselves from my ear lobes. I wondered why she had decided to make nightgowns and scrunchies for gifts. Were my parents low on cash like we are? Were all the nightgowns at K-mart ugly? Probably a combination of the the two...oh yeah and probably because she loved me. That too. So much of what I do now as a new mom I know my mom did too. I remember the summer that she got a food dehydrator and dried tons and tons of apricots and apples, and then dried peppers every Fall after that. I don't thing she does much dehydrating anymore...especially since her dehydrator is sitting in a box behind me. I have big plans for that thing. I also remember that she often used to make homemade noodles. Now she can buy some at the store that are just as good as the ones she made herself. Me? I can't afford those noodles. Plus, I want to make my own from scratch because it would just be so much fun. I've been campaigning for her pasta maker for at least three years. I imagine that there will be a day when Z-cakes will be talking to me on the phone about how she wants to make her own pesto and make raspberry jam without commercial pectin. I'll tell her about how I used to do that too, and then try to give her some advice though I won't remember much. Funny how things cycle around like that. My mom still has a few yards of the fabric that she used to make my nightgowns. She told me that I could have it, but I think I'll wait to use it until Z-cakes is a little older. Then I think I'll make her a nightgown. Funny how things cycle around like that. Aw, this is so sweet. And I totally want a food dehydrator. We never had one when I was growing up, but I watched the Ronco infomercial many times and thought about how wonderful life would be if I could make my own fruit roll-ups. That is an adorable picture! My mom made us matching nightgowns (at least) one christmas, I'll have to dig up the picture and post it. This post reminded me of my mom. She used to have me try on things with my eyes closed, too. I also remember unwrapping packages of material with pattern pieces pinned to them. I knew I'd get it a few days after Christmas. Thanks for the memories. I am glad they are special to you. Now I need to remember where I put the patterns for the nightgowns. Hopefully I didn't get rid of them or at least remember how I did them. Hmmmmmmmmmmm. 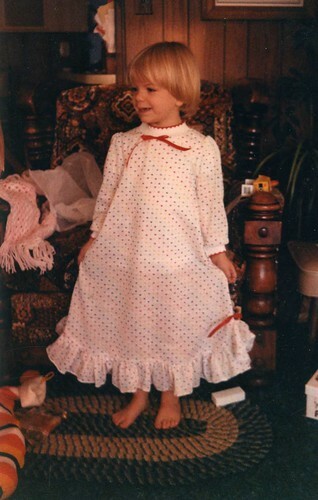 My mom used to make me nightgowns, too. Hey! You define awesomeness. So I have a recipe for homemade laundry detergent if you'd like to try it. I think it works good, and it's about a 10th of the cost of regular detergent. Borax, washing soda, soap. Wah-lah. If you are interested let me know. I have it posted in my notes on facebook....are you on fb? Anyways....Merry Christmas!! !